Oceanspray is an under-utilized plant in northwest gardens. 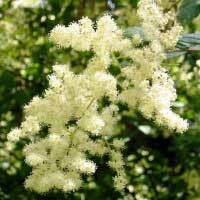 It does exceedingly well on dry slopes and at the edge of deciduous forests of alder and cascara. It can also stand alone as a feature plant in a garden (best as a big, fountain like cluster), or at the back of a border. More tolerant of sun than many other natives, it can even survive on the edges of freeways without any extra watering. It does grow slower in full shade, but still survives well. The large, white to cream, lilac-like flower plumes are dazzling in late spring to early summer gardens. The flowers then turn a tan to brown color and last on the plant through winter.